How Many Miles Did We Earn in 2014? I keep a pretty organized (happy to share if you'd like just let me know below) spreadsheet containing a ton of information about my mileage earning. It also helps me keep track of our credit card applications, minimum spend required, etc...this is very much a team effort as Emily earned a little over 44% of the total in 2014. You can read about our earnings in 2013 here. I looked back at the spreadsheet this morning and summarized it below. We earned almost 1.3 million miles and points last year with the vast majority coming from credit card bonuses. We applied for (and were approved for all) 22 credit cards in 2014. Read this post first if you are new to the concept of earnings points/miles through credit card bonuses. The rest of our earnings shown above were a mix of goodwill from service issues, promotions and other random sign-up bonuses. We earned 400,000 American Airlines miles from five CC sign-up bonuses which we leveraged to fly Cathay Pacific First Class home from Hong Kong. The Citi American Executive Platinum was huge as we grabbed three of those and netted 300,000 AA miles for only $750 in fees! We also used this stash to book a first class flight to Europe on British Airways. We earned 80,000 Alaska Airlines miles which we'll use for a flight on Emirates in the future. I did use some of those points to upgrade my parents on their flight to Hawaii earlier this year. Cathay Pacific First Class - only 67,500 miles one-way to/from Asia! This doesn't include the miles we earned by flying/staying which amounted to another 125,000. We also purchased a handful of miles (20,000) during a couple of promotions across the year and earned around an additional 120,000 or so miles and points for our "everyday" spend including category bonuses and shopping portal bonuses. All in, that is over 1.5 million miles and points generated during 2014! So where do things stand in terms of point balances now? According to Award Wallet, we have (again) over 1.6 million miles "in the bank." This time last year, we had 1.633M points and miles. So we are basically are at the same number despite of points and miles despite a ton of burn for our trips to Bali and Hong Kong/Taipei! We need to do a better job of using them I guess! Happy Thanksgiving! I spent some time over the weekend compiling a few stats from my 2014 travel. These numbers include my December travel. You can read about my 2013 flights here. In 2014, I didn't travel at all for business and flew on half a dozen award tickets so I will be losing my United Premier Gold status early next year. I still managed to fly over 65,000 miles after flying 87,000 in 2013 and 107,000 in 2012. I redeemed United, Singapore Airlines, and American miles for an awesome trip to Bali and our upcoming trip to Hong Kong and Taipei. 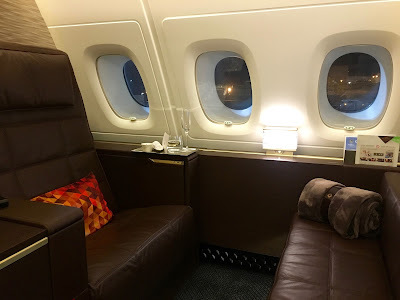 I flew Singapore Suites, Asiana Suites Class and will be flying United's 747 Global First in addition to American's Flagship First on their new 777-300 ER.